Interview with Charlie Paterson and Carrie Paterson on Aspen Public Radio. An invaluable addition to the literature on the birth of modern Aspen… In a life filled with more optimism and achievement than bitterness, “Escape Home” is the capping effort at finding meaning in a life that has included hardship, heartache, success and home. Charles Paterson has lived on three continents, experienced privilege and deprivation, studied architecture with Frank Lloyd Wright, fled from the Nazis, and was separated from his parents at a young age. He came to Aspen in 1949, in time to participate in the Goethe Bicentennial Convocation — as an usher and stagehand — and stands as one of the last remaining Aspenites to have witnessed the birth of modern Aspen. His life [in Aspen] has encompassed the widest range of activities: he has been a ski bum and ski instructor, an architectural designer and a lodge owner, a board member for various organizations, including the Aspen Music Festival and School for 40 years. Perhaps of greatest significance, he has been a family man — not only raising two daughters with Fonda, his wife of 44 years, but also reuniting his family and his family history after both were nearly decimated by two World Wars centered in Europe. In 2005, Paterson sold his Boomerang Lodge, in Aspen’s Shadow Mountain neighborhood, retired, and found himself with time to start in on that history. 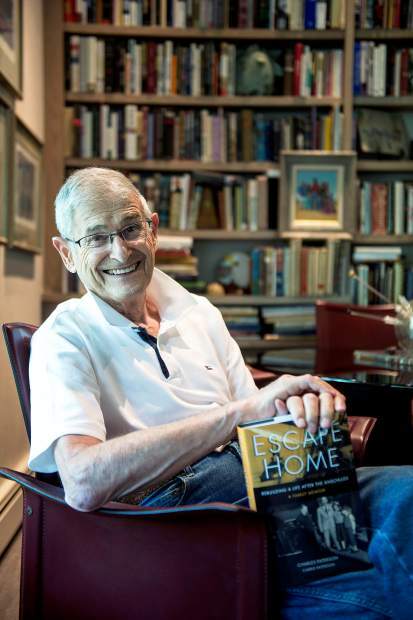 Escape Home, the memoir he wrote with his daughter Carrie, runs more than 500 pages, and represents a spilling out of the sorts of things — a family tree, photos dating back a century, stories of heartache and adventure, recipes — that a more voluble personality might have been disclosing in bits and chunks over the decades…. Paterson’s recollections of his early years in Aspen — being caught squatting in the Hotel Jerome; taking jobs in restaurants, in construction and as a ski instructor; using all means and materials available to slowly expand his property from a cabin to a small lodge; living the bachelor life with his father — is an invaluable addition to the literature on the birth of modern Aspen…. Paterson’s early adulthood also took place outside Aspen. There was a two-year stint in the Army; it was the quiet time between the Korean War and the Vietnam War, and Paterson spent much of his time training in the mountains around Colorado. More significant, Paterson trained in the late 1950s at Frank Lloyd Wright’s Taliesin…. Chapters of “Escape Home” are devoted to [this] uncommon but valuable education — in architectural design, but also in … philosophy and community…. In a life filled with more optimism and achievement than bitterness, Escape Home is the capping effort at finding meaning in a life that has included hardship, heartache, success and home.